The Comeback 2017 Heisman Poll, Week 3: Did Saquon Barkley reclaim front-runner status? Are we overlooking Barkley's Penn State teammate, Trace McSorley? Week one of The Comeback’s 2017 Heisman Trophy Poll saw Saquon Barkley take pole position. In week two, an idle Barkley give way to Stanford’s Bryce Love. Lamar Jackson ran away with the Heisman last year. This year, there appears to be a battle setting up between Barkley and Love, along with other talents waiting in the wings for them to falter. With Love and Stanford idle last weekend and Barkley’s Nittany Lions rolling over Michigan, would Barkley retake the top spot with our voters this week? Let’s take a look at our second poll for 2017 and see how our voters see the race through seven weeks of the college football season. Season: 1387 yards rushing on 135 carries (10.2 ypc) with 11 rushing TD. Love is the most explosive player in the nation, averaging 10.27 yards per carry. Until someone actually stops him, it’s hard to say that he’s not the most outstanding player in college football. Love was idle last week and Penn State dominated Michigan, but my vote doesn’t change. Barkley had a fantastic start to the game, but overall it looks like McSorley might be the MVP of the Nittany Lions this year. While some of his throws were questionable and he got bailed out by his receivers on multiple occasions, there is no doubting that McSorley ran all over the Wolverines and they had no answer to his ground game. Love is still my pick, but the Penn State duo certainly has a chance to change my mind against Ohio State. Last week: 108 yards rushing on 15 carries (7.2 ypc) with 2 rushing TD. 3 receptions for 53 yards with 1 receiving TD. Season: 757 yards rushing on 117 carries (6.4 ypc) with 8 rushing TD. 32 receptions with 3 receiving TD. 1 for 1 passing for 16 yds and 1 TD. 1 kick-off return for TD. Barkley kicked off his game against Michigan with a big touchdown run. His stats are almost as eye-popping as Love’s, but he is lighting up the highlight reels in bigger games. Barkley set the tone for a big night for the Penn State offense against one of the top defense sin the nation. If he can carry Penn State to a win at Ohio State, there will be very little standing in the way of Barkley and the Heisman Trophy this season. Barkley did exactly what was necessary to stay on top of the Heisman race: come up big against a ranked opponent. He set the tone early, knocking Michigan back with a 69-yard touchdown. A previously excellent Wolverines defense had no answer for him, allowing 108 yards and two touchdowns rushing with another 53 yards and a score receiving. If he follows up with similar performances against Ohio State and Michigan State, this race is likely over. 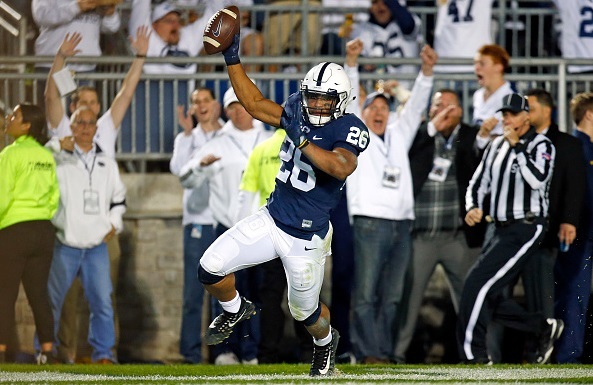 – This past week accentuated the point even more: Right now, this is a two-man race between Bryce Love and Saquon Barkley. That doesn’t mean the race is over, as the stretch run of the college football season makes or breaks Heisman candidates. – Bryce Love and Stanford travel to Oregon State for a Thursday evening game. So far this season, the Beavers have been the second-worst in the Pac-12 at stopping the run. They give up 200 yards per game and have surrendered 18 rushing TDs so far this season. Love has a tremendous chance to put up big numbers and a Thursday night game on ESPN means more eyeballs will be watching him. – Barkley and Penn State pounded Michigan last week. The thanks they get is a match-up against Ohio State in enemy territory. A win against a Top 10 opponent would really give Penn State bragging rights and heighten Barkley’s Heisman candidacy as long as he has a good game. – What if Penn State beats Ohio State, but the Buckeyes keep Barkley in check? Would the Heisman hype then flip to Nittany Lions QB Trace McSorley? He leads the Big Ten in passing yards and has 21 TDs (14 passing, 7 rushing) on the year. – We should also keep an eye on the other QB in the Penn State/Ohio State game. Remember J.T. Barrett? Many wrote him off after the Oklahoma loss but he can get himself back in the picture with a win over Penn State. Barrett is currently second in the Big Ten in passing yards and has thrown 21 TDs against just 1 INT. He also has 359 yards rushing and five rushing TDs. – What about Baker Mayfield? He seems to have faded a bi,t but if Oklahoma can keep winning he will get back in the conversation. He leads the nation in yards per attempt, has thrown for over 2300 yards and has 19 TDs against 2 INTs.